ELECTORAL democracy is in a terrible state in Nigeria. Its practice defies universal standards of acceptable behaviour. But while everything is wrong with democracy in Nigeria,the greatest danger to its development is election violence. Elections are a do-or-die affair in this country, with politicians willing to unleash violence to achieve their ambition. That desperation was on display last Saturday as Nigerians voted in the rescheduled presidential and National Assembly elections. One newspaper described the polls as “elections of blood”, saying they were held “with blood flowing across the country”. That may sound hyperbolic, but, as The New York Times reported: ”Election Day violence killed at least 39 people across Nigeria”. And that’s not counting the severely injured. In one incident, six people were killed by security agents in Rivers State. There was mayhem in Lagos, with over 100 ballot boxes burnt and at least three people killed. 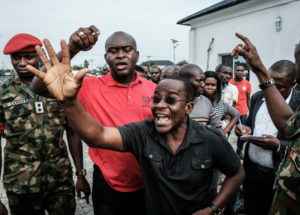 Suspects who were arrested by Nigerian Army personnel on the election day in connection with alleged various electoral offenses, including stealing a carton of Presidential ballot papers, are gathered before being handed over to police officers at Nigerian Army’s Bori camp in Port Harcourt, Southern Nigeria, on February 26, 2019. As I write, PDP has rejected the results of the presidential election, which show President Buhari won with 15,191,847 votes as against 11, 262,978 for Atiku Abubakar. Hopefully, PDP’s rejection of the results doesn’t trigger post-election violence, but, even so, the next flashpoints to watch are the upcoming governorship election. Of course, Nigeria has a history of election violence. Think of the election-related clashes of the 1960s, particularly the Western Region election crisis in 1965. And the conflagration in old Ondo State following the disputed results of the governorship race between Adekunle Ajasin and Akin Omoboriowo in 1983. Some would argue that Nigeria wasn’t politically mature in those days, and that the country would have developed democratically had the military not interrupted the First and Second Republics, which lasted for six and four years, respectively. The military-civilian diarchy under General Ibrahim Babangida’s regime, during which he ruled as a military president alongside civilian state governors, lasted for less than a year, from January 1992 to November 1993. Thus, it could be argued, with some justification, that the short-lived democratic experiences didn’t give Nigeria the opportunity to develop sophisticated democratic cultures. But what excuses do we now have? This year marks 20 years of uninterrupted democratic governance, since Nigeria returned to civil rule in 1999. And this year’s general election is the sixth since then. So, why is it that Nigeria’s democracy hasn’t attained any level of sophistication. Saturday’s elections have been decried by international observers for their operational shortcomings and violence. The elections were characterised by card-reader failures, late arrival of materials and officials, hijack of electoral materials, voter intimidation and killings. As the Commonwealth said, “violence has no place in modern democracy”, and its prevalence in Nigeria’s elections is a political failure! Nigeria is one of a very few countries, where the signing of “peace accords” always precedes a general election. Why? Well, because politicians and their supporters treat elections as a state of war. In 2011, over 800 people died in violent clashes after President Goodluck Jonathan was declared winner of the presidential election. Incendiary comments by his main opponent, General Muhammadu Buhari,were blamed for the violence. The sound beat of violence reached a crescendo in the 2015 elections, so much so that the world literally put Nigeria on a suicide watch to stop it from committing a hara-kiri. Jonathan and Buhari, the two leading candidates, were persuaded to sign peace accords. This year, it’s déjà vu all over again as the spectre of violence hung over the general elections. President Buhari and Atiku Abubakar signed two “peace accords” before Saturday’s elections, witnessed by foreign leaders; but that didn’t stop the violence. Of course, at the heart of all this is a broken politics, the crude politics of desperation. It is the same politics that causes Nigerian politicians to change political parties at the drop of a hat. And, of course, it’s that politics which induces them to engage in nefarious activities, including vote-buying and the use of political thugs, to win elections or to unleash violence. One of the recurring features of Nigerian elections is the influx and stock-piling of illegal firearms in the run-up to elections; intended, of course, to perpetrate violence. Another common feature is hate-speech. When Nasir el-Rufai, the Kaduna State governor, said that foreigners who intervened in Nigeria’s elections would leave in “body bags, that is, carried home dead, or when Buhari used the word “fitna”, which the dictionary describes as “unrest or rebellion”, or when Atiku made unproven allegations that the APC trained operatives in China to manipulate card readers, they were all doing one thing: inciting violence! President Buhari’s jungle-justice orders to shoot ballot-box snatchers on sight also falls in that category. All of this recently prompted some elder statesmen such as Dr Christopher Kolade and Chief Philip Asiodu, under the auspices of “Burdened Elders”, to cry out that: “The nation is bleeding profusely and approaching a frontier it had never seen before”. They said the violent turn of expressions and increasing desperation of the national polity must be reversed. They were right. Nigeria’s democracy is deeply flawed, stuck in utter primitiveness. Recurring election violence will further endanger its development, and that of politics in Nigeria.